The article Why You Won't Become a Millionaire by Budgeting Alone revealed that the average millionaire has anywhere from 1 to 50 streams of income. Want to become financially independent quickly? You'll need to look for ways to make more money on the side. 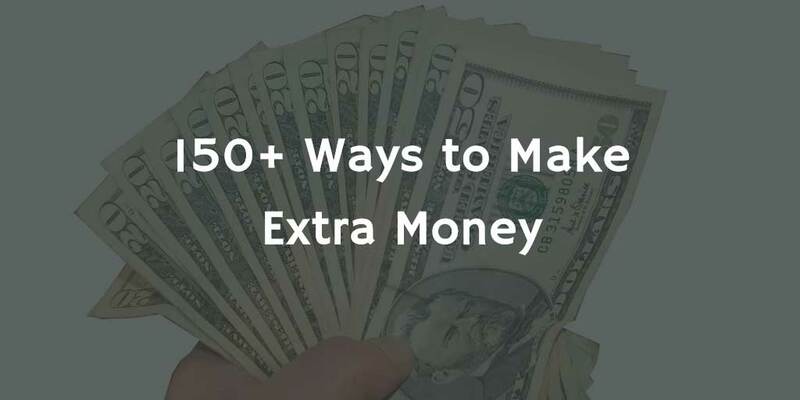 Here are 150+ ways to make some extra cash this year. Note that some of these links are affiliate links, meaning I get paid when you sign up. That brings me to my first point which is how I personally earn some extra cash each month from this website. Did you know that there are bloggers like Michelle from making sense of cents who make over $100,000 A MONTH from their online business? I'm not quite there yet, but I do get an extra $100 here and there directly from this website along with many freebies to review. Michelle highly recommends using Bluehost to start your own site. If you sign up by using this link, you'll also receive your own domain like PersonalGrowthChannel.com and assistance on getting started for free. Read more on how to get started by clicking here. Look around you. Are there yards that need to be mowed? Are there leaves that to be raked? Are there things that need to be fixed? Homes that need to be cleaned? If you are even remotely handy, it is easy to earn hundreds of extra dollars every month by asking your neighbors if they need some help. Once you get started, you can even hire some help and make a business out of this! Remember that in the beginning, you need to work hard, but eventually you'll want to work smarter, not harder. Is there something you are an expert at? If so, you might want to consider consulting or coaching. I'm a life coach outside of my regular job as a general manager. Typical rates for coaches range anywhere from $50/hr to thousands of dollars a month. You'll want to go through some courses for this even if you do consider yourself an expert. While I have read literally hundreds if not thousands of personal development books, been in the business world for over 20 years, have five kids who give me plenty of practice with personal finance, have a reach of nearly 40 million people on Triberr, and have personally lost 35lbs and gone from overweight and unable to run 50 yards to completing 3 Tough Mudders, I'm still continually trying to hone my skills. Here's a life coach certification course that I completed taking to help with this that you may want to check out. Identify how people's brains handle, stores and manage information. Influence how people think, feel and behave in view of achieving their primary life goals. Help clients overcome negative feelings, destructive thought patterns, and bad habits. Identify the common limiting beliefs and misplaced priorities that cause people major issues in life. Use the full range of downloadable life coaching resources that come provided within the course. It's tough to go ask the boss for more money, but done correctly this can be a major source of additional income, and it is recurring! It generally isn't as simple as going in and telling your boss that you want more money or you quit though, those types of ultimatums are as likely to get you an invite to take a hike as they are to get you a raise. Check out this course for an in-depth look at how to approach this touchy subject. Take a look at #7 investing in yourself for some other ideas on how to get that raise. Services such as Fiverr.com and ServiceScape make it easier and easier to Freelance and offer your services for cash. You will also want to set up a basic website using a service like Bluehost in order to put your best foot forward in order to compete against professionals. You can even use freelancers from Fiverr or ServiceScape to quickly create logos , create banner ads , and more . 6. Don't Spend Your Money! While this might not be the first thought that comes to mind when you are looking to earn money, as Benjamin Franklin said, "A Penny Saved is a Penny Earned." If you aren't already living with a spending plan in place, you should consider using a program like YNAB to track your spending, and taking a course or two in order to stop wondering where your money went at the end of each month. I personally like Adam Hagerman's Budgeting for Budget Haters and Dave Ramsey's Financial Peace University, both of which provide a comprehensive look into how to manage your money in order to save thousands every year. Did you know that research has shown that $1 invested in yourself can return $1,000 or more every year? Why not invest in yourself by signing up for some courses? I have personally invested a great deal of money in myself, and it has been worth every penny. I'll never forget the first time I did this. I invested in some Microsoft certifications early in my career as I saw the demand for people with those certifications going up. By spending a couple thousand dollars on certifications, I landed a job making $20,000 more a year because I was now qualified to do it! Click here to explore common certificate programs in most career fields. Once you've invested in yourself, you can go back to #4 and request that raise! Local retail and food places are always in need of help. Why not take up a second job with a local restaurant or retail place instead of watching TV? Why not create your own Amazon, eBay, or Shopify store or just through Facebook buy/sell groups? It's easy to find deals locally through garage sales and flip it online. Most people are just looking to get rid of stuff at a garage sale, they aren't looking for top dollar, so that leaves you room to make money. Buy locally, mark it up, and sell it online, or investigate drop shipping to sell with no inventory. There are many resources to help with this. Click here for a course for selling on Amazon and here for a course for selling on eBay. I'm partial to Shopify, maybe because they pay me when I send people like you to sign up. But seriously, they're one of the biggest names in the business, and you have complete control over things and can even integrate with the other two I mentioned. They even have their own courses built in to teach you how to be successful. You can sign up for your Shopify site by clicking here. If you are in a commissioned position where the more business you generate, the more you earn like a sales position, the best way to earn more money might be to figure out ways to generate more business. Courses like Chris Croft's Sales Hacking or Brian Tracy's excellent material can help you take your game to the next level. Any investment in making yourself the best in your field can help you increase what you are paid for each hour you work, sometimes even doubling or tripling your rate. You should always attempt to maximize what you make during your core working hours each week, and that means going the extra mile. Most people eventually realize that their time is limited, and in order to generate more money, they have to find ways to make money without investing a lot of time. Look into investing in rental properties, stocks, bonds, mutual funds, or anything that you can buy which will make you more money than it costs to buy the asset. Those are my top ideas for making some extra money this year. Here are more than 300 extra ideas you can use to generate some extra cash from around the web. I hope you've gotten some good ideas from this list. Be sure to share and subscribe for more tips each week!